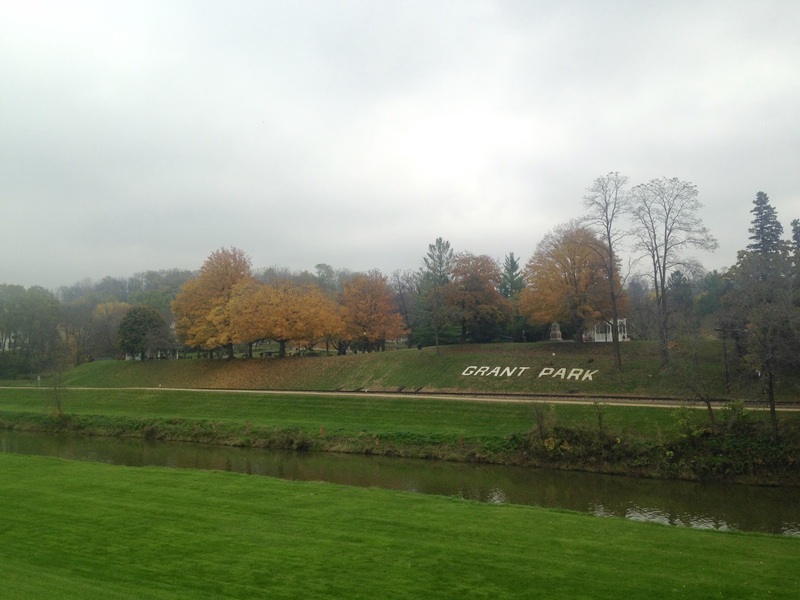 In last week's travel post, I shared a weekend trip to Galena, Illinois. 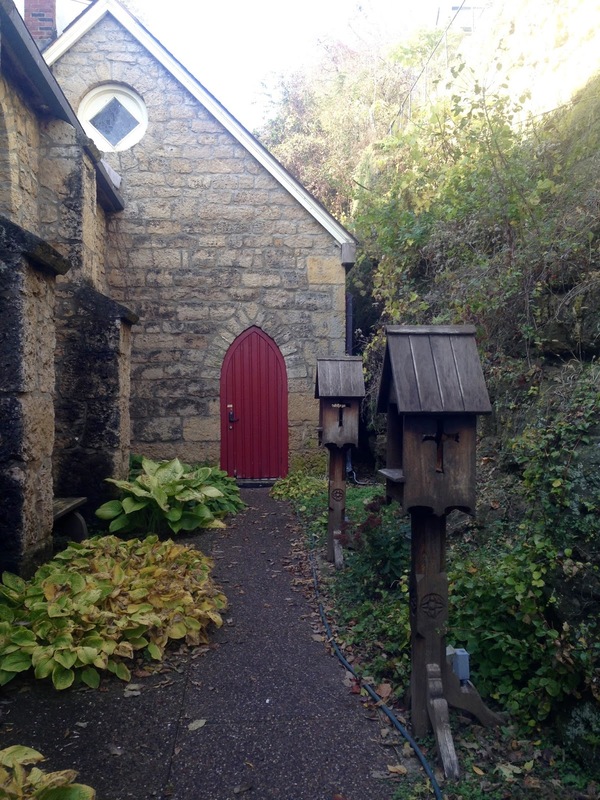 This week's travel post is a continuation of that weekend. 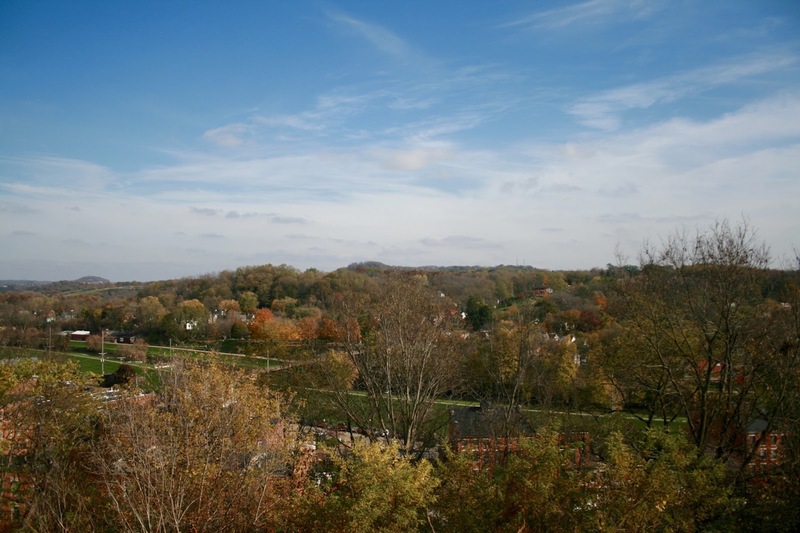 In my last post I focused on the shopping district of Galena, this post will focus on the surrounding neighborhood. After we reached the end of the shopping district we saw the gigantic flood doors (see last week's post for a picture) and some steps leading up high. You couldn't see where the steps were leading to, so of course I had to climb up to discover what was above the mysterious steps. To my surprise was this pretty river, bridge, and a beautiful river walk. The lovely iron pedestrian bridge takes you across the river to Grant Park. Because the river walk is above the main street level, you get a nice view of the neighboring city above and also a great view of the main shopping district below. After walking along the river for a bit, we went back over to the main shopping district so I could grab a Chai Tea Latte for energy. 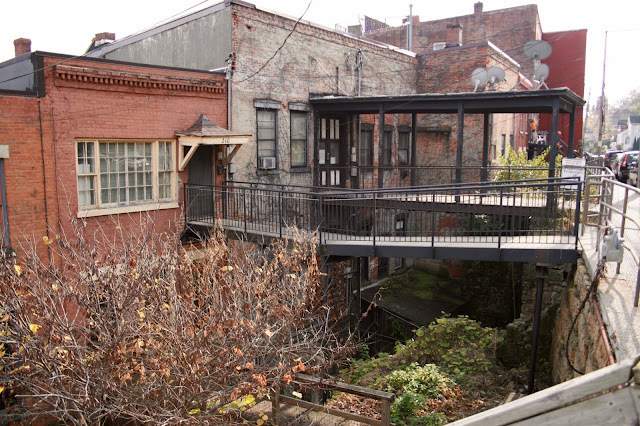 I would need it to climb up the steep hills to the neighborhoods above the shopping district. 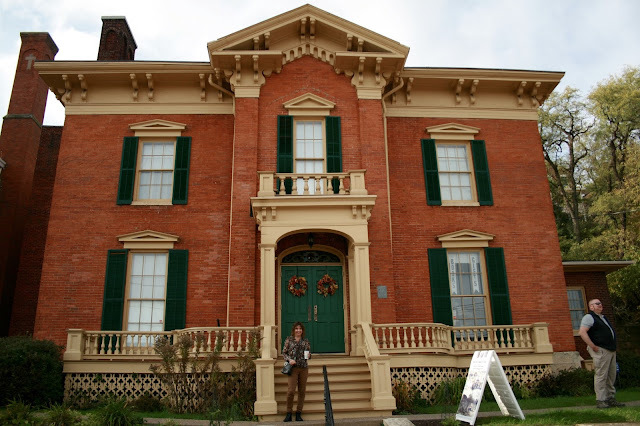 This gorgeous building is the Galena museum. We popped inside but didn't stay because it cost $10 per person. We thought that was a little steep for a small town museum. If you read last week's post, I stated that this is town that charges for everything, so you really have to pick and choose what is most important for you to see. You could go broke trying to see everything. This is the backside of some buildings across the street from the museum. 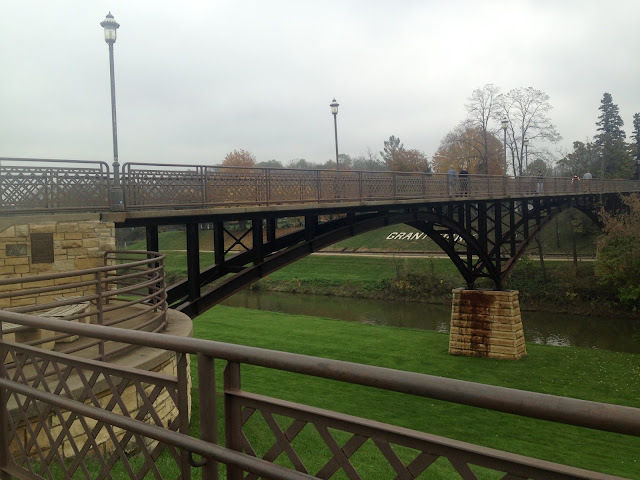 I thought it was interesting how they had to build bridges to access them. 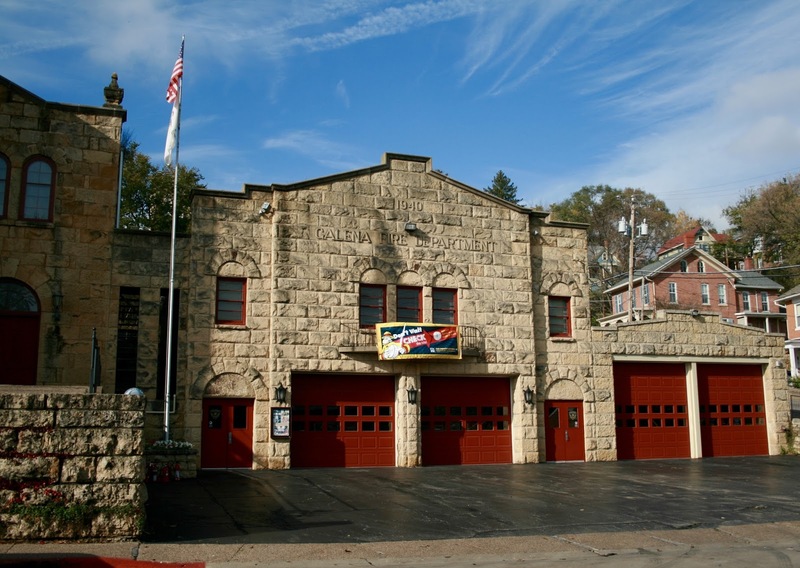 This is the Galena Fire Department. 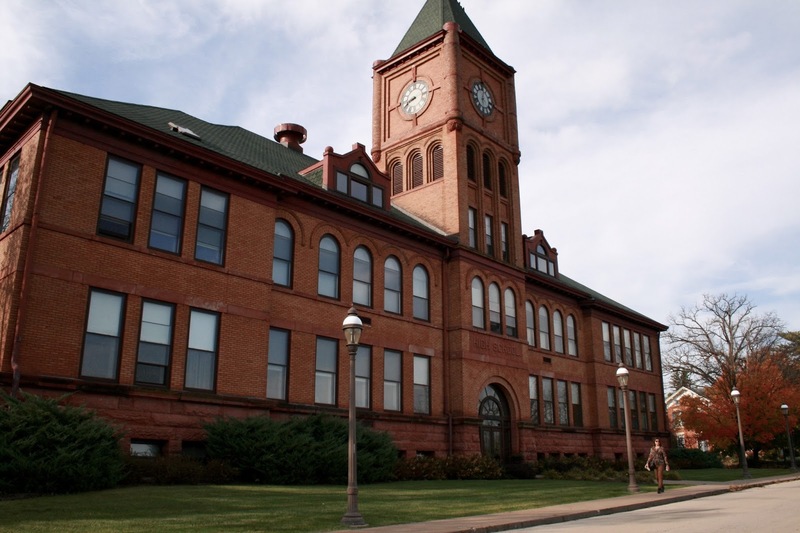 It is located right next to Turner Hall . There are several beautiful old churches in Galena. This one I was able to peek inside of. It was not as impressive inside as it was on the outside. 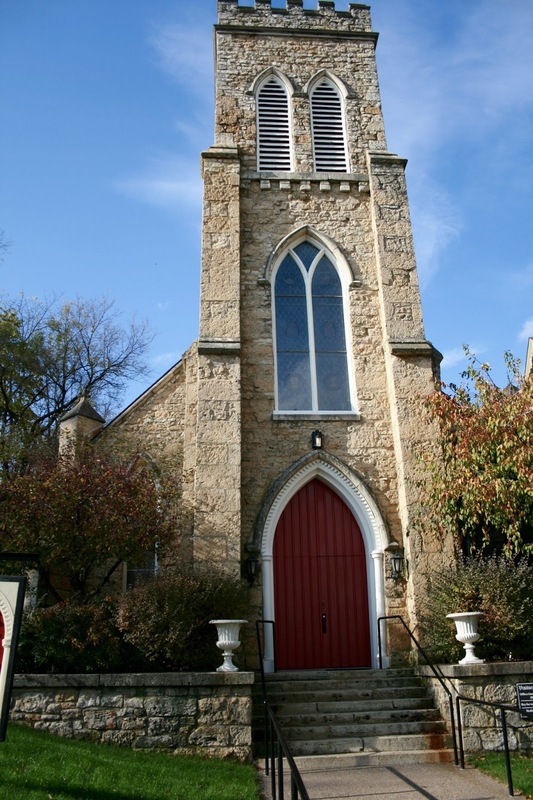 This is Grace Episcopal Church, the oldest Episcopal church in continuous use in the Diocese of Chicago. 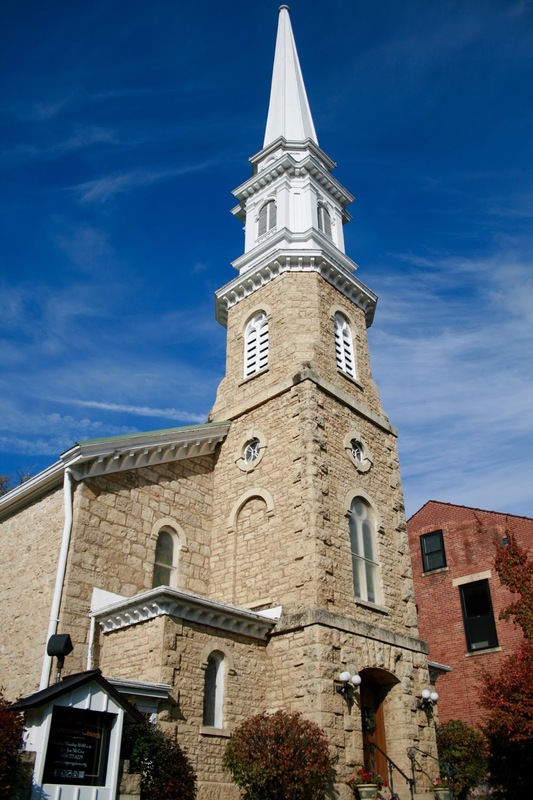 The building was consecrated in 1850. There is a beautiful meditation garden that is open to the public. 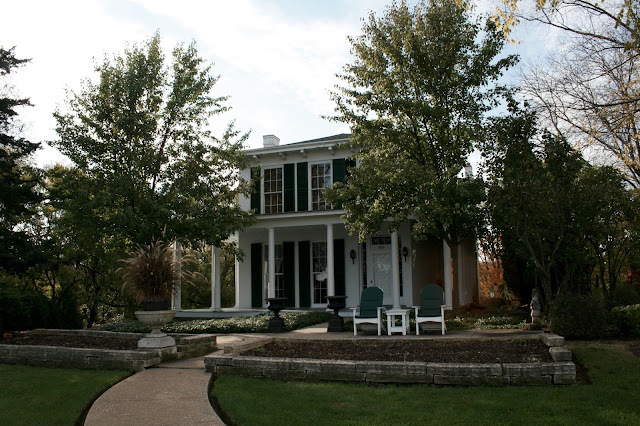 There are many lovely bed and breakfasts in Galena. 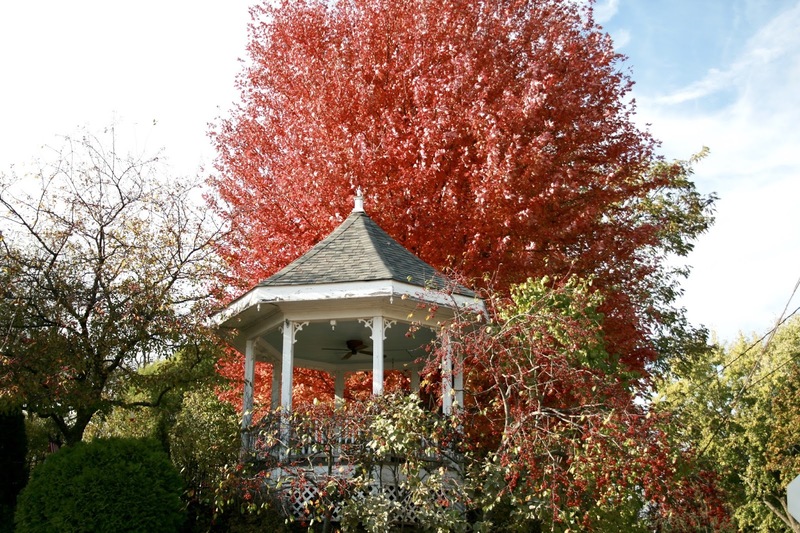 We saw people having brunch in this gazebo as we walked by. 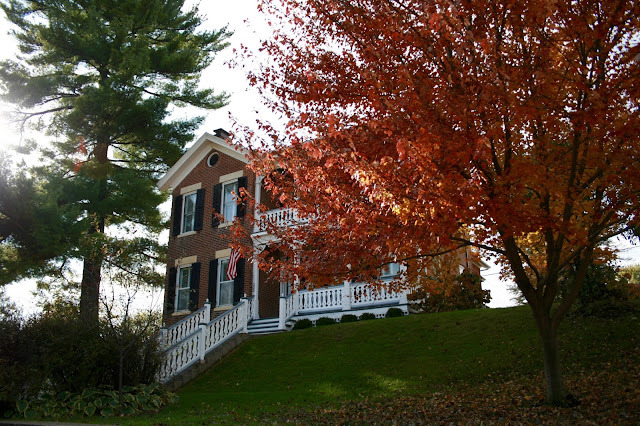 If you admire old homes, taking a stroll through Galena neighborhoods is a feast for the eyes! 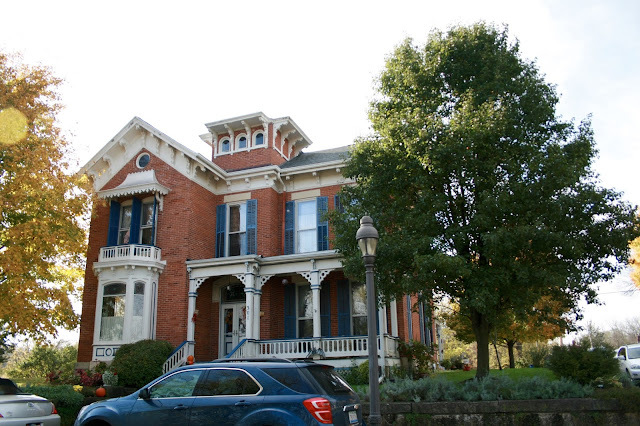 I love this old brick home. It reminds me of my own except I don't have shutters or an upper level porch. The detail they put into the brick work and woodwork long ago is simply amazing isn't it? 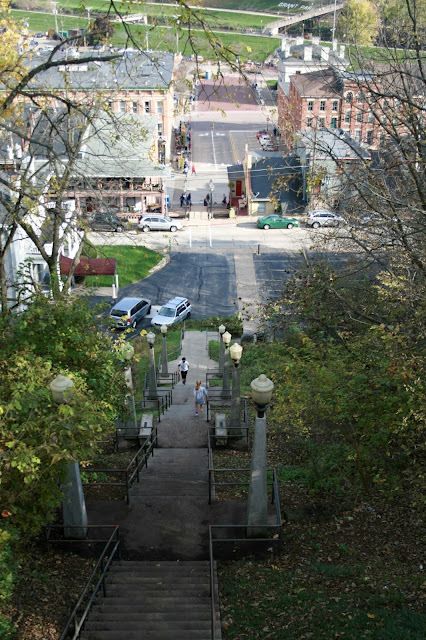 And if you're wondering how high above the main street some of these homes are, these are the stairs we had to climb. The view these homes have is breath-taking! This was once Galena's high school. Now I it's been converted into condominiums. I peeked inside the window to the lobby...it was quite luxe! The funny thing was as we walked past it appears they still use their gymnasium for sporting events as we saw young athletes walking out of the back of the building. 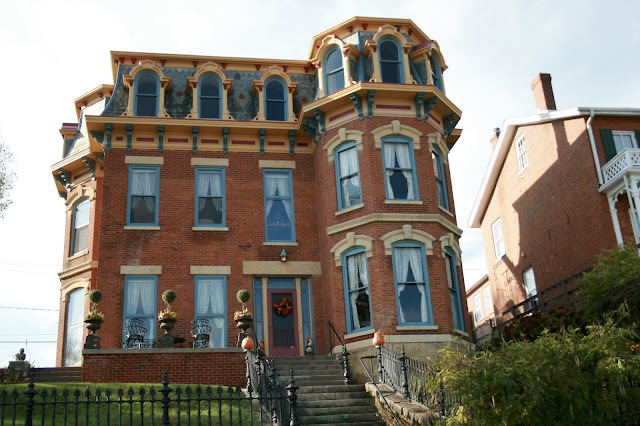 This was one of my favorite homes in Galena. I loved the tall windows, can you just imagine the light? They had an unobstructed view of the city of Galena too, hence the lawn chairs in the front yard. I really like the style with it's massive pillars and the landscaping. I wouldn't mind at all calling this place home. After we were done walking around the neighborhood we decided it was time to head back to our car and to our hotel for the night. The next day we headed home enjoying the scenic views of the Coulee Region once more. Well, for those who come to my blog for travel posts I fear this was my last travel post for awhile as I am all caught up and I have no new adventures to share. The winter weather has been terrible this year, so we have not been able to go on any more weekend trips. We are also in the middle of renovating our master bedroom and we need to be home on weekends to work on it. I am planning on spending a week in the Chicago area at the end of February, so hopefully I will see some sights then that I will be able to do a few travel posts on. Otherwise our next big vacation is not until the end of May. We will be going to Myrtle Beach and Charleston, so if anyone has any travel tips about those areas, I'd love to hear them. We will be spending five nights in a ocean front room at a beautiful hotel right on the beach. Then we'll just stop in Charleston for the day on the way home. Some very special houses there, Amy. Our American rellies have glorious family holidays at Myrtle Beach and absolutely love the area. And you will have plenty to photograph in Charleston! Thank you! That's good to hear about Myrtle Beach, I've been reading a lot of mixed reviews. What a beautiful town Galena is. Such beautiful buildings! My favorite is the one with the blue window frames and arched windows on the 3rd floor. We missed these homes when we were there, but hopefully we'll make it back to Galena this year and plan more time there. Can't wait to read all about Myrtle Beach and Charleston. 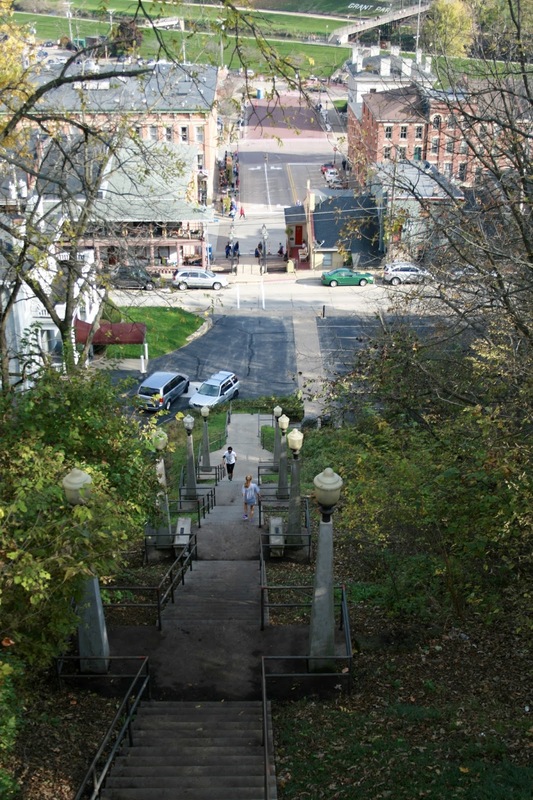 Thanks Elli, I hope to get back to Galena too and actually take a few of their tours. Looks like an adorable little town to meander through. And it looks like you went at the right time of year with all of the beautiful/colorful trees. Thanks for sharing! Yes, it was. It was the last weekend of any type of color...so we made sure to get out and enjoy it! Thanks Cathy, I'll go check it out. We always planned to put a gazebo in our yard too but then we realized we would never actually sit in it so it would be just a very large garden ornament. What a beautiful place. I love that bridge and the old church... we saw some old (but small) churches when we were in Paris several years ago and I just find them so peaceful! I also love bed and breakfasts that have some charm and history to their buildings. It looks like such a splendid and rich trip! Thanks Carrie. I love old churches and old homes! I love those beautiful old homes!!! I wish we had kept some of the artistry to home building --- now they all rather look the same. I couldn't agree more! They just don't make them like they use too!